ATLANTA — Early in his Saturday-night press conference, Tiger Woods said, “I made some nice putts, good lord.” Nice putting and a three-shot lead. Good Lord. But he wasn’t, of course, done. You have to close in tournament golf. Nobody knows that better than Woods. And if somehow he forgot that fact-of-Tour-life over most of the past half-decade, when he was largely in the game’s shadows, his visits to Tampa and Carnoustie and Bellerive this year slapped him upside his head, by way of reminder. In those three events, he was chasing. Yes, you can win from behind and Woods has, a bunch. But the vintage Woods victory formula has been to own Saturday night, then pick his spots on Sunday, without ever relaxing. That’s what he was looking to do on Sunday. And when he made a take-that birdie on the 1st, to increase his lead to four, Tiger Woods looked like you-know-who. But before the day was over, it got hairy. Hairy and scary and wild. He made a bogey on 15 and another on 16. He was leaking oil, like many 42-year-old players have before him. He did well to make the two bogeys. Then on the par-4 17th, his second shot flew the green and went down a hill and into the kind of spot you that is completely unpredictable, surrounded by grass but sitting on hard pan. Anything could have happened from there. Billy Horschel, pesky guy, was in the house at nine under. Woods was one bladed shot from coughing this thing away. But he didn’t do that. He played a spectacular sort of chunk-and-run, he was nothing but money on the ensuing four-footer and he played the last, to use a word he hasn’t been able to use for a long while, with some cush. Eighteen on Sunday at 6 o'clock, as Tiger marched up it with Rory McIlroy, was absolute pandemonium. For a few hectic minutes, the sheriffs and cops and security officials — many of them burly men with huge voices and necks that were huger yet — could not control the crowd. Thousands of spectators, nearly all of them sweaty men, a good number of them over-served, swarmed the fairway. If you were in this dense mass of humanity, you could barely breathe and you might have found it scary. Woods was ahead of the fray, but only by a few yards. It was like a a great pressure valve had been released. There were rhythmic chants for the winner, for one of the greatest winners any sport has ever witnessed. But it felt like more than that. “The art of clapping is gone, right?” Woods said good-naturedly later. Back in his prime, he hated it when crowds got near him. “You can’t clap when you’ve got a cellphone in your hands.” MORE: Tour Championship payout | FedEx Cup bonuses for every player He made his par on the last, fighting back tears, and won by two. Won for the first time in more than five years. Won for the 80th time on the PGA Tour. His girlfriend and caddie and manager had the good grace and common sense to leave him the whole of the green, for a long minute. He had his space. He had earned it. He won by two. “Father Time is undefeated,” Tiger likes to say. But sometimes you can push him back. If Woods has ever had a more inspiring or moving win, you’d be hard-pressed to name it. The win at Hoylake, at the 2006 British Open, comes to mind, just weeks after his father had died. A few others, maybe. Not many. With $1.6 million in fresh earnings from his win, Woods’s career Tour earnings now exceed $115 million. In the nebulous category of career Tour wins, Woods trails only Sam Snead, who is credited with 82, some of them funky. A year or two from now, maybe Woods will own that record, too. “I've still got a chance to play some more golf and maybe I'll keep chipping away at that number and maybe surpass it,” Woods said “But I just think that what I've gone through and what I've dealt with, I've gotten lucky, to be honest with you. I've gotten very lucky.” He’s never been this candid. It’s refreshing. What Woods did on Sunday, and through the week at East Lake, defies numerical analysis. Strokes gained: putting, take the rest of the day off. Over the past 15 or so months. Woods has shown the human capacity to change. To recover, to soldier on, to analyze. To improve. Physically, mentally and likely spiritually, too. What Woods has done should inspire any of us looking to do the same. Tiger Woods, after more than five years without a win, finally got a victory. He won the Tour Championship on Sunday in epic fashion. The starting point for this extraordinary win — it defies ranking but we’ll take a stab at it later — is his work ethic. On Sunday, when he arrived at East Lake, ancestral golf home of Bobby Jones, Woods was carrying his Sunday uniform — the red shirt, the black pants — on a hanger, with a gym back on his right shoulder. He was wearing gray workout shorts and a black sleeveless T-shirt, his baseball cap on backward. Do you think for a minute he cares what Jones would have made of this entrance? Tiger, very much his father’s son, stands in defiance of the country-club golf experience. He’s the first golfer who approached the game as a heavyweight boxer. In his post-victory remarks on the 18th green, Woods kept going back to one of his favorite words: work. Speaking of his play on 18, he said, “I still had work to do.” Describing his mindset during the bogey train, he said, “I’ve got to get back to work here.” Regarding his station in life, he said, most tellingly, “I’ve worked my way back.” That’s his starting point. He’s always had admiration for other players who do the work. Charlie Howell, Jim Furyk, Bernhard Langer. The alchemic result of work and talent is 80 Tour wins, the first coming at age 20, with different equipment and a different body. He was Gumby then, and Butch Harmon gave him his every position. Now he’s built like a college safety and has no teacher at all, just all his tapes and all his memories. The stakes in this Tour Championship were high for Woods, higher for him than anybody else in the 30-man tournament in which he was playing, an event designed to help the rich get richer. Woods was playing for the monster payouts, of course. He even had an outside shot at the $10 million payday that ultimately went to Justin Rose. (Thank-you notes may be sent to the corporate offices of FedEx, Coca-Cola, Southern Company, plus BMW, for the courtesy cars.) But Woods has other motivations as well. He was playing to justify the work, mental and physical, he had done to get himself back in contention. And to announce — by way of four scorecards and not talk-talk-talk — that his present and future could look something like his past. Saturday night was set in sepia tone. Woods’s 65, 68 and 65 scorecards at East Lake — one of the game’s jewels, a demanding par-70 course returned to its former glory over the years by the course architect Rees Jones — looked like they came out of his prime. (In 2000, at East Lake, Woods’s first three rounds were 68-66-66. You can make the case that nobody has ever played better golf than Woods did in 2000.) But all the work — there’s that word again — to get to his three-round total of 198 this week would mean nothing without a seal-the-deal Sunday. It was the rare early-fall Sunday when the PGA Tour, live on NBC, could make a dent in the NFL ratings. Come 2:05 p.m., Eastern daylight time, the final twosome in the final round of the season finale would be off and running. That twosome was Woods and his Nike-mate, McIlroy, who trailed him by three. It’s already been six years since Weiden + Kennedy made that charming and jazzy Nike spot, where Tiger and Rory take turns taking dead aim and giving each other the needle. After one hole-out, McIlroy says, “Just trying to keep up with the old guy, you know?” Woods in return says, “Dude, is that your real hair?” Their Sunday chat at East Lake was less jovial. There was the big-bro handshake on the 1st tee, and then nearly four hours of player-to-player quiet. When Woods’s 12-footer for birdie went dark on one, it was just the thing McIlroy didn’t want to see, particularly when he did not match it. But 17 holes later, they were talking. “Rory was saying, coming down 18, between our second and third shots, 'This is like Jack in '80 at Baltusrol.' I said, 'Yeah, I just don’t have the tight pants and the hair.'" It’s cool and great, how much golf history they both know. Nicklaus won the 1980 U.S. Open at Baltusrol at age 40, after a winless 1979. The crowds went crazy there, too. In the twosome ahead of them was the ultimate $10 million man. Rose was tied with McIlroy through three rounds. They’ll see a lot of each other next week, in Paris. On Sunday, in Atlanta, they were trying to be the party poopers. (Every party has at least one.) But neither could ever put any heat on Woods. On the 5th tee, McIlroy found himself yelling, “Fore left!” At that very moment, Woods was unfolding one of his homemade sandwiches from its aluminum foil wrapping. Stifling the competition has always been Woods’s true Sunday modus operandi. He all-but-won dozens of times by Saturday night, making Sunday not a formality but a calculated game of chess on a giant outdoor board. That’s what he was trying to do at East Lake Sunday. 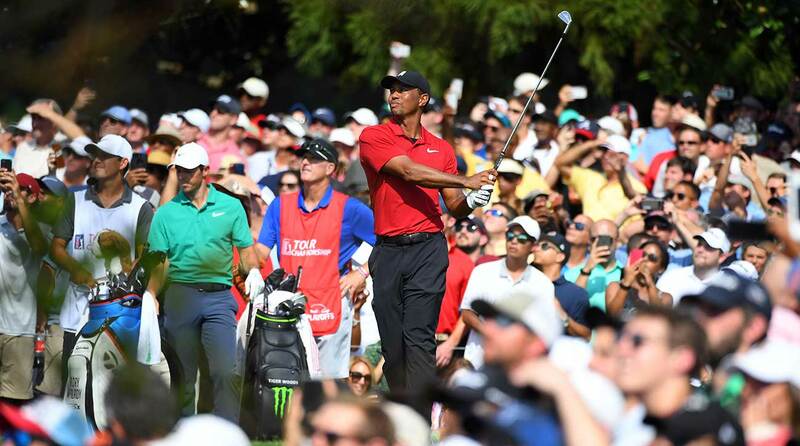 The harder the course, the better for Woods, and East Lake was demanding in every way exAnother yelled, “Bet the house on you, Tiger!”cept length. Going into Sunday of the Tour Championship, Woods had the lead, outright or shared, 57 times in his PGA Tour career. He won 53 of those times. Now he’s 54-for-58. You almost can’t believe it. Woods — along with Big Jack, Lee Trevino and Mickey Wright — is one of the smartest and most calculating golfers the game has ever seen. Of course, when you can play the shots he can play, it’s easier to play smart. But dumb is always lurking in golf. He seldom came close to making a mental miscue. Sunday was almost boring, until those back-nine bogeys. But many of his wins were kind of dull. Woods has never said it was his job to entertain you. This was an ideal week for Woods to win. For starters, he had only 29 other players to beat. Yes, they were 29 of the best golfers in the world, but at the majors and some other events you face 100 or more of the best players in the world. For another, he likes the course, which shares broad similarities to Augusta National, another course he likes. He’s a superb fast-green putter, and the East Lake greens were mowed grease. He likes courses where you can see the trouble. He likes courses where he has good memories. In eight earlier visits, he had one win (in 2007) and three seconds. Also, warm days are good for his aching back, and East Lake this week was baking. Late tee times are helpful, too, as he has to go through a long and elaborate process of stretching and lifting and soaking before he gets to the 1st tee. His tee times this week were all after high noon: 12:30 on Thursday (with Ryder Cupper Tommy Fleetwood), 2 on Friday (with Ryder Cupper Rickie Fowler), 2:30 (with then-World No. 1 Justin Rose on Saturday), and of course Sunday at 2:05 p.m., with another Ryder Cupper.